Heat oven to 350°F. Grease 12-cup fluted tube cake pan with shortening or cooking spray. In small shallow bowl, mix granulated sugar and cinnamon. Unroll each can of dough into 1 large rectangle; press perforations to seal. Cut each rectangle into 8 rows by 3 rows, to make 24 pieces per rectangle (48 pieces of dough total). Place about 1/2 teaspoon cream cheese on centre of dough piece. Fold dough over cream cheese, and gently crimp it around cream cheese; roll in sugar-cinnamon mixture. Repeat with remaining dough pieces. Place cream cheese-filled dough balls in pan. Sprinkle with remaining sugar-cinnamon mixture. In small bowl, mix brown sugar and melted butter; pour over crescent pieces. Bake 35 to 40 minutes or until golden brown. Cool in pan 10 minutes; run knife around edge of pan to loosen. Place heatproof serving plate over pan; carefully turn plate and pan over. Remove pan. Cool 10 minutes longer. Cover and refrigerate any remaining bread. Try fruit-flavoured cream cheese in place of the plain cream cheese. 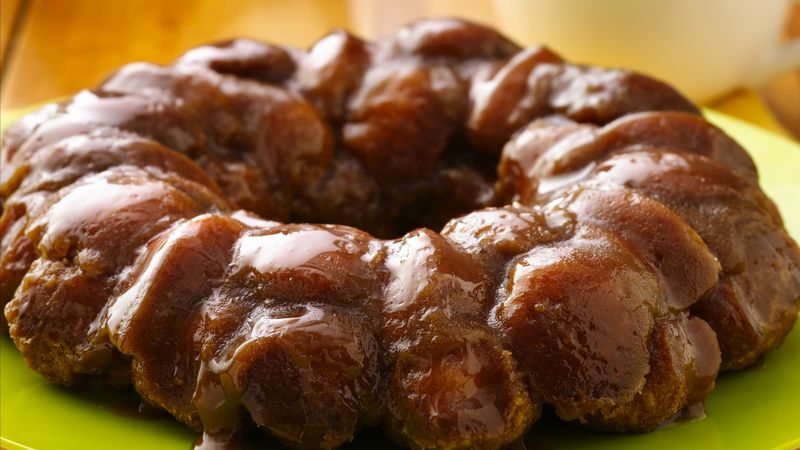 Store any remaining monkey bread in the refrigerator to keep the cream cheese food safe.